For many businesses, Amazon (NASDAQ: AMZN) operates as both a competitor and a partner. The online giant offers a platform for companies to sell their goods while it also competes with the same companies it works with. Now, the digital retailer has launched Amazon Storefronts, a new "store" that exclusively sells products from small and medium-sized businesses from the United States. It offers more than 1 million products curated by Amazon from 20,000 small and mid-sized businesses. Companies from all 50 states are represented, and the launch selection includes collections of products in categories including back to school, Halloween, home, kitchen, pet supplies, and books. Storefronts also offers business profiles and videos so customers can learn about the companies they are buying from. Amazon has launched a new "store" for small and mid-sized companies. Image source: Amazon. While Amazon's efforts are likely not truly altruistic, the retailer is doing this partly to support small business. Storefronts gives a bigger platform to products that have the potential to sell well, and that's good for both the online retailer and the small and mid-sized companies it's partnering with. "We've created a custom, one-stop shopping experience for customers looking for interesting, innovative and high-quality products from American businesses from all across the country," said Amazon Vice President Nicholas Denissen in a press release. "Amazon first invited businesses to sell on Amazon nearly two decades ago, and today, small and medium-sized businesses are a vital part of Amazon's large selection and commitment to customers." Small and medium-sized businesses that sell through Amazon have created 900,000 jobs worldwide, according to the retailer's Small Business Impact Report, which it released earlier this year. The company claims that more than one million small and medium-sized companies in the U.S. sell on its platform. The online retail leader plans to support Storefronts with its first-ever national advertising campaign. 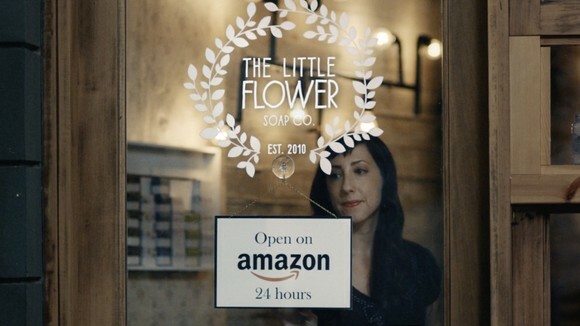 In the ad, customers get to see how Amazon "helps businesses get their products to customers all over the world." This is Amazon playing both sides of the coin. It allows the company to keep being a behemoth that offers goods at the lowest prices possible while also supporting small and mid-sized businesses. In theory, Storefronts allows consumers to shop the retail giant while also supporting local companies. It gives a platform to businesses that, on their own, won't have anywhere near the reach that Amazon has and allows them to build a customer base that would have been impossible to grow otherwise. This is a smart play by Amazon, and it should benefit small businesses as well. This is a sales opportunity for both sides. Amazon gets access to unique goods to sell its customers, and small/mid-sized companies get expanded reach to show off their wares.